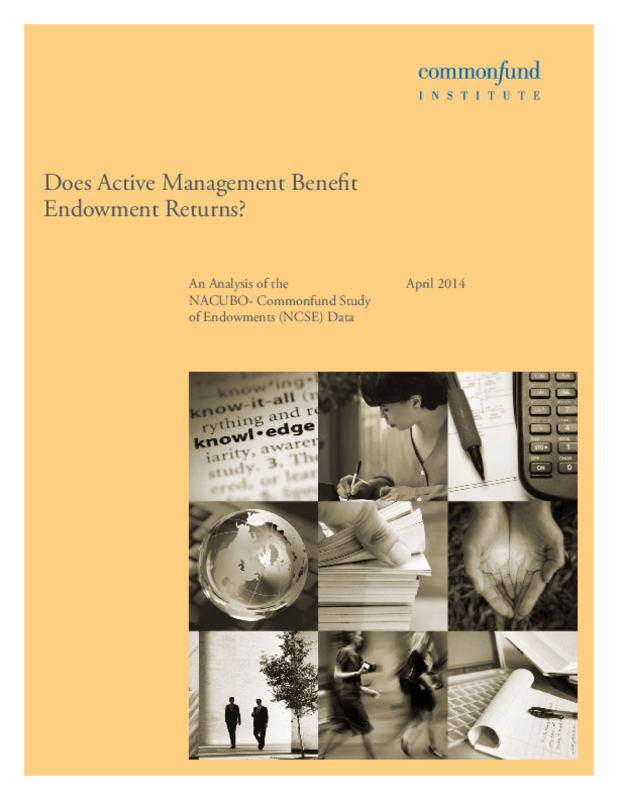 Does Active Management Benefit Endowment Returns? We conduct a longitudinal analysis of the NACUBO Commonfund Study of Endowments (NCSE) results from 2006-2013 to evaluate if active management is related to higher endowment returns in U.S. equities over time. We also analyze the data to evaluate the endowment characteristics that are related to higher levels of performance over time. We find that active management for endowments is significantly positively related to higher returns net of fees from U.S. equity allocations over the evaluation period. In addition, endowments with CIOs or OCIOs are better able to earn incremental positive returns from active management than those without. Larger endowments are better able to earn incremental positive returns from active management than the smallest endowments but the effect appears to diminish as endowments increase in size. Title: Does Active Management Benefit Endowment Returns?